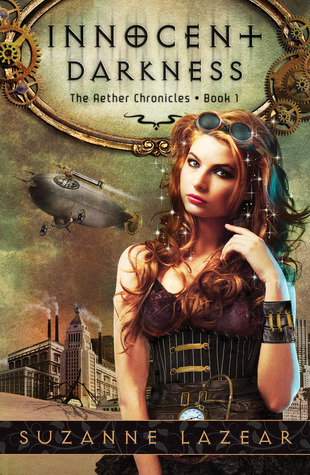 A beautiful and fantastic Steampunk find...... Presenting The Aether Chronicles #1 Innocent Darkness by Suzanne Lazear. After finishing Innocent Darkness I can safely say that although my reading portfolio for Steampunk is still quite young (it began with Cassandra Clare's Clockwork Angel), I must concur that barring 2 or 3 that i didn't like, the rest of them were simply the best of the best.... and now Suzanne Lazear's Innocent Darkness is added to it and I definitely am more than happy. Circa 1901, Innocent Darkness is not just history but also the appropriate amount of Steampunk as well...... hovercraft, and steam engines, and airships, and zeppelins and what not steampunky gadgets and inventions. Add to it the mysterious, mischievous, swoon-worthy, intense, lithe and dangerous Faery of the Otherworld and you have yourself a new favorite and another marvelous edition to the list. And this is how the story begins with Noli right in the middle of it all. A girl of an era where for a girl to have free independent thinking is frowned upon by society, where the only interest for a girl should be of marrying well. Strong-willed, confident, determined, and as free thinkers, something never seen for the girl of the era, she becomes a favorite character. An affinity for fixing things and test driving without permit is what gets her into trouble and sent off to Findlay, a reform school. Confident at first, she quickly succumbs to the abuse and loss of the only friend at that horrible place. She breaks down and in her grief wishes herself away. V is another, or should I say one of the main characters after Noli, and while I say he is the good guy.... But he hides a big secret too, he is an exiled Fae Prince and had more than friendly feelings for Noli (*giddily-swoons*) which she returns......... he is quite the dashing Prince too...... What follows is a high octane, tense and passionate romance between them both penned beautifully by Lazear..... And Noli's life gets spared in the process through the most unlikeliest of solutions... you need to read to find that out. "Innocent Darknees had the right mix of YA, the right mix of paranormal and steampunky enough for our tastes"